Find out more about our Log Storage range. For keeping wood dry and neatly stored, a specially designed log storage unit is ideal, combining practicality and style to create something that will look at home in any garden. This attractive product has a rustic, weathered finish, suiting the ever-popular shabby chic décor as well as a natural, minimalist garden style. 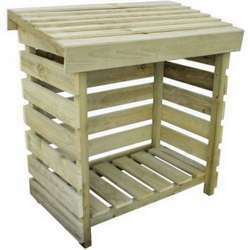 It is very spacious, and the slatted sides and raised base provide plenty of ventilation to keep the wood dry. We use only the best pressure-treated timber to create our log storage, making it very durable and able to withstand the vagaries of British seasons. Our log storage is long-lasting, attractive, and easy to maintain, making it the ideal way to store wood in any space.